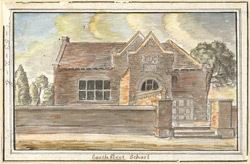 View of Southfleet School in Kent. It is situated at a crossroads near the parish church of St Nicholas. The school was founded in 1637 by Sir John Sedley, a Baronet of Kent. It is of red brick with mullioned windows and a semi-circular porch arch.